Now that we have officially welcomed summer, make sure you’re taking the right steps to be an active participant in the activities that come with it! Activities such as walks along the beach, road trips, and backyard barbecues should be fun events in the summer. However, for people with hearing loss, these events could be stressful because of these challenging listening environments. Did you know that new hearing aid technology offers features which allow people with hearing loss the ability to enjoy the sounds of summer without compromising their ability to communicate? The new technology also focuses on reducing background sounds such as wind and party noise that could be bothersome. Digital hearing aid technology can control background noise in a variety of different ways while adapting to each new environment. Many new, more sophisticated digital hearing devices can do all this in the startup automatic program leaving you free to enjoy your day without the need to make manual adjustments. Automatic features can adjust the hearing aid microphones to enhance speech audibility while reducing background noise differently for different listening environments. For example, at a party, the microphones may be directed toward the person you are listening to while decreasing the volume of the conversations beside and behind you. Additional “behind the scenes” noise reduction features also work in conjunction with the automatic program. These features specifically look at very soft noise (i.e. hum of the air conditioner) and impulse sounds (i.e. dishes clanging). All of the noise reduction features in the hearing aids can be applied accordingly to optimize the speech signal while also improving listening comfort in most noisy situations. 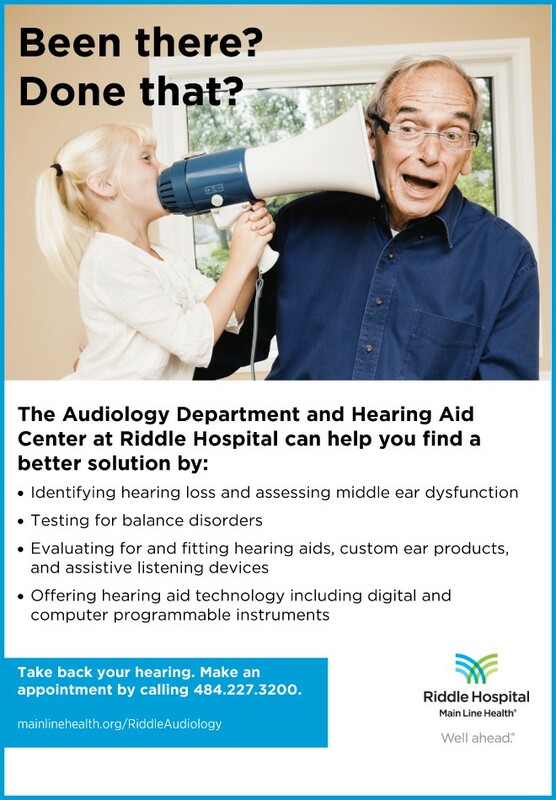 The audiologists at Riddle Hospital, part of Main Line Health, share the same goals that you do – to improve hearing and understanding even in your most difficult listening environments.A comprehensive audiological evaluation followed by a listening needs assessment and live hearing aid demonstration will allow the audiologist to make the best recommendations for a hearing treatment plan tailored to your listening needs. ← Previous Story Do Missing Teeth Really Matter And How Can I Replace Them?